If you’re a fan of classic, old-school styled slot machines prepare to be dazzled by the sizzling hot wins that are on offer in the 5 Dazzling Hot slot machine which has been developed by Euro Games Technology. 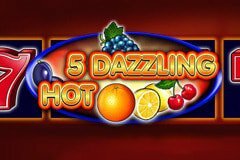 The 5 Dazzling Hot slot is targeted towards players who like to play fruit machines online with lots of delicious fruit like watermelons and grapes accompanying shiny stars and valuable 7’s which can see you reel in the top prize of 100,000 coins as they burst into flames in true sizzling style. There are no bonus features like free spins modes or pick ‘em features included either, instead it only offers the bog-standard EGT features of a gamble mode and the Jackpot Cards progressive which enables quick gameplay! The reels are always hot with an impressive return to player percentage of 95.74% boasted and it consists of a rather basic 5 reel and 5 fixed paylines structure (hence the reference in the title) which makes it perfect for the beginner slots players amongst you as well as those of you that like traditional slots instead of the 3D slot machines which developers focus on releasing nowadays. There’s nothing extraordinary about the symbols that you’ll encounter on the reels of the 5 Dazzling Hot slot machine – they are those you will be well used to seeing if you have played online fruit machines before, however there are very large wins on offer which will leave you dazzling in amazement! You’ll be surprised to hear that there is only one special symbol and it is not a Wild which we are so used to seeing included in most slot machines nowadays. Instead the only special symbol is the Scatter which is represented by a bright and shiny yellow star, and while it does not trigger any bonus features, it does offer a 50x your stake win should you light up the reels with five of them on a single payline. That’s not the most valuable symbol though, as landing a winning combination of five 7’s on a payline sets the reels on fire and results in a dazzling 1,000x your stake win – extremely impressive for such a simplistic slot machine! There are lots of other big wins achievable thanks to the variety of fruits that feature on the reels, and the wins often prove to be very juicy indeed as they offer payouts of a similar value rather than there being a vast difference between the highest and smallest valued. These include a watermelon, bunch of grapes, two plums, delicious melons, a whole orange, plus two cherries which are seemingly a firm fixture in traditional slots. While the Fruits Kingdom slot machine and some other traditional slots released by EGT offer a very rewarding free spins feature, the 5 Dazzling Hot simply offers the bog-standard gamble mode and Jackpot Cards progressive that they implement in all of their games. The gamble mode will need no introduction to most of you – it offers you the chance to double your winnings should they be worth less than 35x your stake. You can choose to gamble after a winning combination and then face a playing card flashing intermittently between red and black and then have to click the colour you think it will stop on when you do so. A correct choice doubles your winnings however an incorrect choice sees you kiss goodbye to them instead! The Jackpot Cards feature triggers completely at random and sees you select from twelve face down playing cards with have the four different suits on them (three Clubs, three Diamonds, three Hearts, and three Diamonds), with the first three that you match winning you that corresponding jackpot! Unfortunately, there is nothing hot about the 5 Dazzling Hot slot machine apart from its title. The only impressive aspect is the payout for five 7’s on a payline, however the realistic chances of this happening are slim and certainly don’t justify spinning the reels over and over. Instead you should check out other online fruit machines developed by EGT such as the 40 Super Hot slot machine and the Flaming Hot slot machine which both offer 40 paylines, the opportunity to stake higher amounts, include Wild symbols, and consequently offer the possibility of even greater wins!